A Deluxe Twin Accommodation Room. -Writing pads, pens, iced water and mints. This fully enclosed, air conditioned venue, offers a breathtaking panoramic view of the Brisbane CBD, Brisbane River and South Bank Parklands. The venue is also perfect for gala dinners, wedding receptions, conferences and trade shows. After an extensive $12 million renovation with Old Hollywood Charm and state-of-the-art rooms can comfortably cater for up to 550 delegates. Located on the Podium Level, Podium 5 can be used as an exquisite 12 seat boardroom, private dining room or a conference secretariat. The room features a fully integrated 55" LED TV. Purpose build boardroom features state of the art audio visual equipment & broadband. Rydges South Bank is located in the heart of Brisbane's arts and entertainment precinct. Activities in the precinct are endless with regular events and showcases on art, music, food and films. It's the perfect place to take advantage of Brisbane's outdoor lifestyle; wander through the weekend art and craft markets, take a dip in South Bank's Beach, or enjoy a barbecue or picnic in the lush parklands. The Brisbane Convention & Exhibition Centre is immediately adjacent to the hotel and Downtown Brisbane and the "Bohemian" Village of West End are a 10 minute stroll away. Rydges South Bank Hotel offers all Conference Organisers and Delegates state-of-the-art Audio Visual Technology and Equipment. With full support from both our staff and our Audio Visual support team, we can provide you with a stress free event. Podium Events Centre offers wireless internet access with iPad connectivity throughout the level. Each room has individual data projection & sound capability. Level 12 Rooftop offers broadband internet access for your conference presenter with ceiling mounted data projectors and screens in each room. Brisbane conference delegates & function attendees can also utilise our affordable, high speed, secure broadband Internet services via wireless (Wi-Fi) connection from all public areas. Prepaid access cards are available to purchase from reception. A small business centre is located opposite reception and features two workstations where guests can check their emails, browse the Internet or use one of the many Windows applications, including PowerPoint. Documents can be printed using the dedicated printer and information can be transferred to disk or memory stick. High speed, secure broadband Internet services via wireless (Wi-Fi) connection is available all public areas. Rydges South Bank also has two restaurants and two bars, 24 hour reception, 24 room service & valet parking. 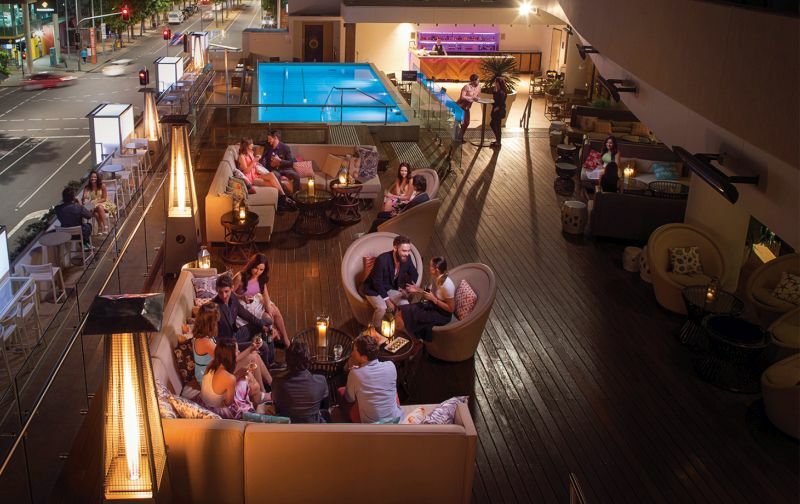 With its exquisite menu, opulent surrounds and poolside bar Bacchus brings a new level of style and sophistication to Brisbane's wining and dining scene. Located on the ground floor of Rydges South Bank, CBD offers a casual meeting place to catch up over a meal or drink. CBD boasts an extensive range of wood fired pizza, and a selection of local and imported beers. Turning 20 years old on June 20, Rydges South Bank has just become the youngest hotel in the city. One of the country's largest all-room redesign and refurbishment projects has just been completed, propelling the hotel onto the world stage, befitting for its position as room-keeper in the most dynamic and celebrated part of Brisbane – South Bank.